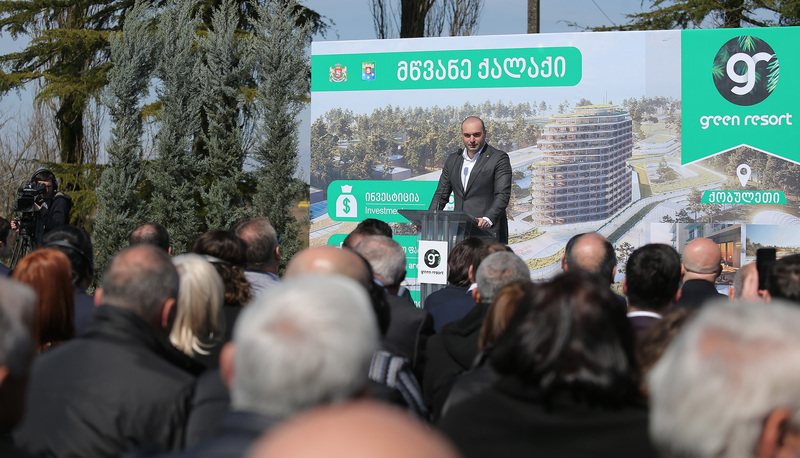 We are launching an unprecedentedly far-reaching project worth half a billion in Kobuleti, marking the largest investment in Adjara, in our tourism infrastructure, Georgian Prime Minister Mamuka Bakhtadze stated in his speech at the construction launch ceremony of Green City and Golf Course in Kobuleti. According to the Head of Government, this project involves the construction of the new Green City poised to become Georgia's calling card. "We are talking about a large investment to transform Adjara into a year-round destination. We are talking about a large-scale project poised to become a genuine pearl throughout the Black Sea Region, one that will ensure that Georgia positions itself as the tourism leader," Mamuka Bakhtadze said. According to the Prime Minister, it is especially important that the investments from EU member states are increasing. Georgia-EU free trade regime, the Head of Government said, allows for even larger investments from the leading European countries. "We are talking about FIFA-standard football pitches, tennis courts, and one of the best golf infrastructures in the world. This will enable us to attract to Georgia those tourists who are not currently viewing the country as a destination because we do not have this kind of infrastructure. I would like to thank our investors who have decided to make this unprecedented investment in Georgia. It is especially important that investments from EU countries are growing. As you know, the free trade regime between Georgia and the EU offers the best opportunities further to increase investments from Europe's leading countries," Mamuka Bakhtadze emphasized. The Prime Minister thanked the leadership of the Autonomous Republic of Adjara for supporting the implementation of said project. "It is very important to us that this project will enable us to create 500 new jobs for our citizens in Adjara. During construction and beyond, after this unique resort is commissioned, small enterprises will be able to receive significant benefits from this large-scale investment. In three years, one of the best resorts in the world will be built in this territory stretching 180 hectares, and we will all be proud of it. Once again, I congratulate you on this day. This half a billion GEL large-scale investment will transform Adjara and Georgia into a center of tourism," Mamuka Bakhtadze said. The construction of the multifunctional Green City incorporates 180 hectares of land in Kobuleti, in which Green Resort will invest 500 million GEL. The resort's construction and operation will employ 500 people. The project involves building a golf course, football pitches, tennis courts, swimming pools, and entertainment and recreation areas. In addition, a 250-rrom high-class hotel with conference halls and leisure infrastructure will be built to be operated by an international brand.